I have had the six months smile treatment here and am really pleased with the results, I have been coming for over a year and Dr haj and her assistants are really patient and friendly, they made me feel at ease on every visit,I would definitely recommend anyone to come to this dentist, and there's a lovely fruit and veg shop opposite! Thanks for all your help and advice. This is one of the best dentists I have been to they are are so friendly, polite and helpful. I have recommended a lot of people that I now to Dr Haj and they have been very happy with the service and work. 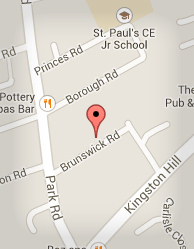 I would really recommend going to Brunswick Dental Rooms, they are great and professional. It's been a year since I had my 6 months smile, I keep meaning to write a review. Well do not hesitate to get this treatment done if you're considering. It has changed my life! I spent years embarrassed by my small uneven teeth, I never smiled in photos and was called gummy. Now my smile is the first thing people notice. Not only did I have my teeth straightened but after a chat with the dentist I decided to have laser gum surgery to help my gummy smile. I now feel like a movie star! My teeth and smile are amazing and was a bloody bargain! I had the best experience, pleased with the treatment I had (6 months smile), the staff are all lovely. I needed to travel from Wales to London for my appointments but the journey was worthwhile. Extremely happy with my new smile. Thanks everyone! Definitely recommend it. My top teeth had always annoyed me, especially my uneven smile and the way my front two teeth crossed over. In fact, they more than bothered me. They always caused my head to turn in every photo and if in the unlucky event I got cornered for a front facing photo, I felt that I had no option but to close my lips and hide my teeth. At 23 years of age and in a job where I meet new customers every day, I felt that I just could not face traditional metal braces. I knew that they would make me feel even more self-conscious just like when I wore them as a young teenager. Oh, how I wish I'd followed through with my treatment back then. If only there was an undetectable way of straightening my teeth. Then one day on a work assignment, I met up with Dr Haj Manku-Barlow of Brunswick Dental Rooms. I mentioned my concerns for my smile and how I hated the idea of wearing metal braces. Haj introduced me to a new concept in orthodontics called 'Invisible Braces'. It was as if all my dental prayers had been answered as I sat back and listened to her outline the perfect solution for my crooked teeth. Getting started could not have been easier – a couple of impressions of my teeth, a few photographs and x-rays and, within a fortnight, I was able to see a computer-generated animated video (Clincheck) showing how my teeth would move to achieve my new balanced smile. I change each aligner every fortnight and visit Haj for regular checks. The aligners are very comfortable and I wear them every day and night, removing them only to eat, brush or floss. I am now half way through my treatment and I can already see a marked improvement in my smile. Most people don't even notice I am wearing the aligners and my lifestyle has not been disrupted in any way. I am already feeling more confident in myself as I know I am already well on my way to the stunning smile I have always dreamed of. I would strongly recommend everyone with concerns about straightening their teeth to visit Haj and discover how she and Invisible Braces can not only change smiles but also change lives.